For Daniel "Danny" Rand, "truth is the only thing that matters," which is good for us because the Funko Pop Iron Fist figures are spectacular. Whether you're a fan of the original comic book hero or the modern Netflix Iron Fist version, the release is more than appealing for both subjects. In the 1974 Marvel Premiere #15, readers were greeted by not only his debut appearance but also the origin story of Rand. Soon, the young man "Danny" would become the Immortal Iron Fist—complete with a green-and-yellow costume. 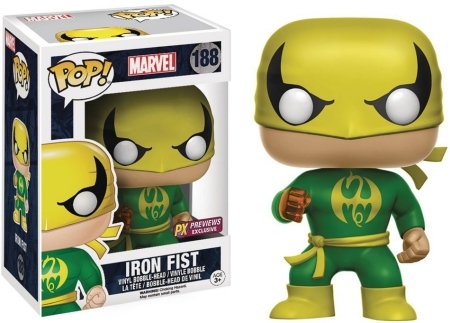 This classic version is first among the Funko Pop Iron Fist figures. Although the superhero suit covers his dragon tattoo, it is shown in yellow over the green attire. Order Funko Iron Fist Figures on Entertainment Earth. While many comic book characters receive drastic updates, the Living Weapon has remained relatively untouched. 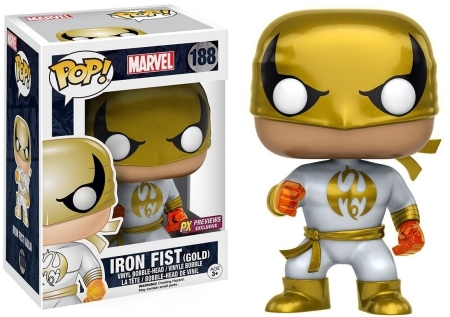 This is evident by the second Funko Pop Iron Fist figure that wears the same hero disguise as the original, except with white and gold. Also different is the Iron Fist gold option shows him harnessing his chi in both hands instead of one. Part of the Pop! Marvel family, Funko Pop Iron Fist was originally issued through the PX Previews program. Iron Fist is also included in the superhero team covered in The Defenders series on Netflix. Featuring their own lines of Pop! Figures, Iron Fist is joined by Daredevil, Jessica Jones and Luke Cage. See related options to Iron Fist figures with our other Funko guides.